Red wire must be center pin on plug (aka a center positive barrel)! EDIT: The barrel in the image is just an example, choose a barrel with thicker wires than this. See http://forum.techinferno.com/enclosures-adapters/10090-visual-guide-opening-akitio-thunder-2-pcie-box-powering-via-barrel-plug.html#post134535 for picture guide to do this. Use this screw terminal variant instead available by searching ebay for "5.5X2.5mm DC Power plug Terminals Connector Adapter Power -female"
Actually it's a very simple mod. I have a barrel plug handy so what I did is cut it out, separate the outer and inner wire, twist outer wire with molex's black ground and the inner wire with molex's 12v yellow and that's it. The other 2 wires of (red and black) are unused. In use the barrel plug is connected to Akitio board, the riser is UNPOWERED. I'm not sure it we should also power the riser but I have it running fine for me up til now (9 hours without any crash). The price is not right I min opinion, it seems like they all cost ~$25. I make this tutorial on how to build a Molex to Barrel, I'm not an expert but I hope it works! It is rated to pass 12V / 10A. I bought this molex extension to create a molex-barrel adapter, but I'm not sure which cables I have to use. Are the yellow one and the black one next to it? Yellow is 12v and red is 5v, isn't it? I would stronlgy recommend you to use more than 1xmolex to power the barrel plug. Better get a 2nd one and combine them. I haven't read that before! Two yellow cables (12V) together in one entrance of the barrel pin and two ground cables to the other entrance? Is that what you are saying? I have a 500W PSU and I thought to use one pci cable to give power to my graphic card and one molex cable to turn on the Akitio Box. Yes! The cables aren't the problem, but (imho) the Molex plug is. The plug isn't made to transfer that much power. If you imgine e.g. the 6-Pin PCIe plug has 3x12V pins and 3x ground pins. 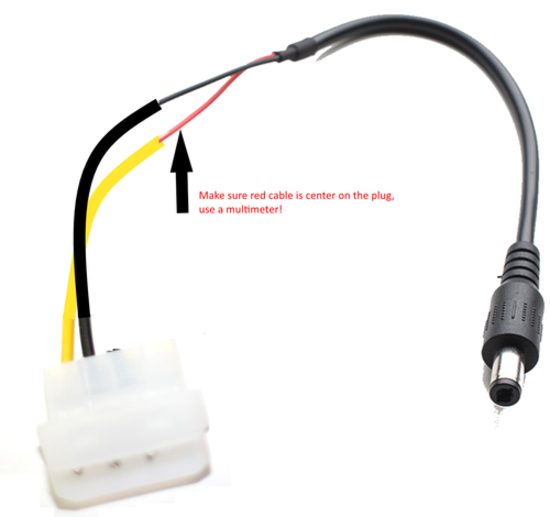 Transfering the same power on a Molex plug with just 1x12V and 1x ground could be risky. 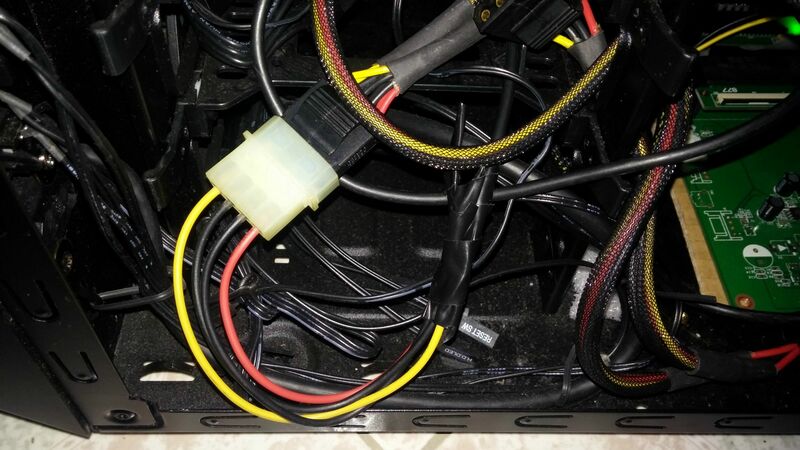 So my advise is to spread to load on at least 2xMolex plugs, like the 2xMolex -> 6-Pin PCIe adapters do. Since you will have more than just one Molex plug... use them! Ok, I understood! I am going to try buying this one (I think I can return my molex extension). EDIT: Now I've seen another one with 3 yellow cables. Is it going to give more stability or it doesn't matter 2 or 3 cables? Still… if you are going to use the barrel plug with screw terminals, I can't say if 3 cables will fit. can I leave the other yellow cable detached? As long as you are using 2xMolex plugs and 1x yellow wire from each of that plugs you are fine. If there is a 2nd one... just shorten it and make an isolation on its top (or just use this 3rd wire as well). Ok, I am going to try with the 3 yellow cables version. If at the end is impossible to use all the cables I will use two of them. Is not a bad option. Another question, my PSU has a Type3 cable to three female Molex. Is ok to provide energy? I don't think I am going to need another Type3 cable to separate the two male Molex to Barrel-pin (one per Type3 cable), isn't it? Well, at the end I bought the cable with three yellow cables but was impossible to introduce more than two inside the adaptor. I used two yellows and two blacks, next to each other, not tangled. The yellow cables inside the positive symbol side, and the black ones in the negative side. Just make sure to remove and isolate the unused 3rd wires (they do not fit into the screw terminal anymore?). I tried a couple of times but was impossible to introduce the 3rd wires into the screw terminal. The only solution is to cut a few thin grey wires inside each cable to reduce the volume and have space for all three cables but I think is not a good option. Maybe if the cables have a small quantity of grey thin cables this will give energy problems. Well, I just try to test my adapter molex-barrel and it was impossible. The connector doesn't enter Akitio box. I think the size is incorrect, maybe they gave me a connector with a size 2.1 instead of 2.5. Has anyone here had problems with this type of connector? Well… it has to be the one with 2,5 and 5,5! Yesterday I finally received the correct connector (2.5mm) and I could start my molex-barrel test. I tried the Akitio with an USB 3.0 PCIe card and it seems that everything is working properly. Now the next step is to begin testing the graphic card but I have to wait after Christmas for that. I'm guessing this won't work right? Noob mistake I guess. So, how can i fix it? @Enano Seems ok, but I would recommend to make that with two Molex plugs.